I’m very excited about this event … and it’s not very long now until it’s here! 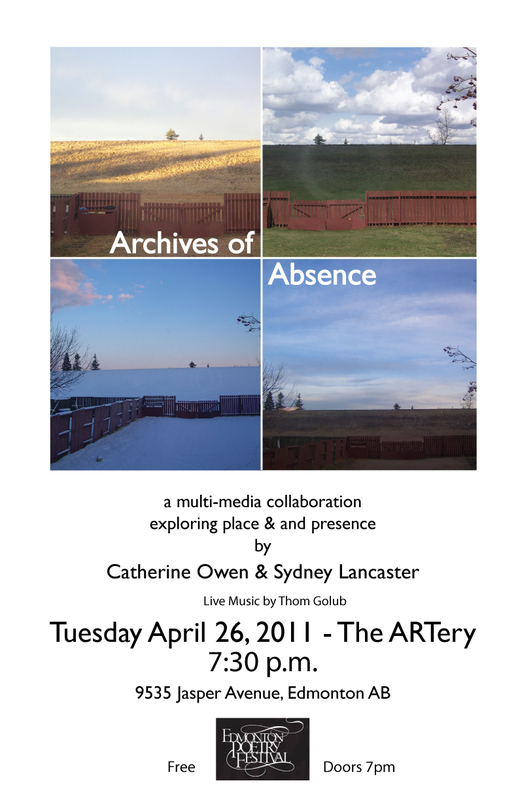 This event on April 26 marks the debut of over two years of work on the Archives of Absence project for Catherine and me, and so far, I am delighted with how it’s all coming together. Archives of Absence is a meditation on landscape, the environment, notions of home/alienation and the transformations wrought through art. This event will feature an exhibit of artifacts and gel transfer photographs, video loops, music, and a reading from two new handmade chapbooks of poems released by rednettle press: Berm, morning eclogues and Berm: a miscellany. It is going to be amazing to see all of this work in one place, together – these separate elements have all been developed and completed over time and in disparate places (I was working on some of the gel transfers in Halifax and began the video there, Catherine was writing in Edmonton and editing in Vancouver; Trisia Eddy at Red Nettle Press in Edmonton has been collaborating with both of us long distance and in person on the book design and layouts, edits, and revisions. The other person that needs to be thanked is Thom Golub, the wonderful bass player (upright!) that will be providing musical interludes, counterpoints, and comments for us on the 26th. Thom is a great musician and composer, and is a welcome and vital addition to our launch event! I am hoping that – after this brief release into the world – we will be able to get some proposals out ot various galleries and literary events across the country, and take it on the road. This launch event is one night only, and most of the artwork will only be up at the ARTery until May 1 – so it would be great to have more opportunities to present the project to other audiences. Working on this project has taught me a great deal about my relationship to this city, to the landscape as a whole in this area. The physical space delineated by the Berm (and it’s very existence) mark this place in a unique way. I haven’t seen this type of structure in other cities – certainly not used to the extent that berms are created and deployed here – and as Catherine noted, before her move here from Vancouver, she’d never encountered a berm at all. So, this really has brought home to me how much Archives is about space and specificity of space, and how much there is here, in Edmonton, in Alberta, even in a city this size. I’ve also become even more acutely aware of how liminal spaces like this are, and how little we can ever occupy spaces like this (perhaps any space, really) in any kind of permanent way. I find it fascinating that despite the berm’s artificiality – its genesis as a completely human construction imposed on the landscape – it is a space that humans can never really dominate or contain in the same way they do the spaces on either side of it (subdivision, freeway). Archives of Absence has also reinforced and refined my ongoing interest in memory and story. Working with the physical aspects of the space – the Berm itself and with the various artifacts we found there – has made utterly tangible the anonymous interlacings of story and event that is human life. These traces, these histories all intersect in one space over time … and they are there to be uncovered and explored, if we take the time to look. This is a privileging of the absolutely ordinary – detritus of the doing of daily life that we generally ignore – or dismiss as garbage. The waste left behind when living has been done. But it tells us so much about who we all are, and leaves glimmers of very personal moments to be acknowledged and (thus) re-membered in to being. Some of it is terribly funny – some of it is sad, but it’s all important in its own way.